We buy Umbrella strollers to make the quick jaunt to the store with baby on board a breeze! Well...at least more of a breeze than it would be with a standard stroller or a jogging stroller. Got twins? A double stroller is what you need! A light weight double stroller may be the best lightweight stroller for you and will make travel so much more pleasant for a weary mom! While single and double umbrella strollers are fabulous, we should not expect complete strolling perfection. 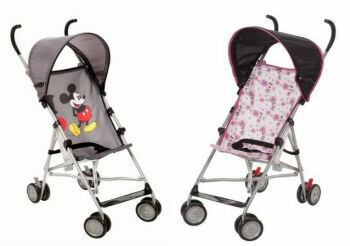 For example, these inexpensive, lightweight strollers are for walking and not running. The tires will simply not work well for anything more than a moderate trot. And if you’re taking baby to the beach, the wheels are not large enough to handle deep sand very well no matter how slowly you travel. The best umbrella stroller on earth won't work under these conditions! Be aware that you would have to carry most baby toys or accessories as these strollers aren't built with storage in mind. You may need a better canopy to protect your baby from the sun, too. Even the best umbrella stroller on the market seems to be lacking in at least one of these areas. A cheap price is one of the characteristics that make these strollers so attractive to many budget-strapped parents. In fact, moms that visit us say that this model by Cosco is the best umbrella stroller for the money. The price is currently stated at less than $20 and the shipping weight at only 6.4 pounds. The Cosco would be an excellent choice for a travel stroller, easy to maneuver through the airport and get on and off the airplane. Parents with more than one child have double the need for an inexpensive, lightweight stroller. Most are willing to accept the shortcomings of umbrella strollers and make sacrifices in order to scale down the weight and the price. In order to compete with other styles of strollers on the market manufacturers are loading our strollers with luxury features such as more storage, beverage holders and handlebar extensions so that tall people can enjoy the complete strolling experience in comfort. Many newer models are appropriate for newborns as they now have fully reclining seats. Strollers that do not recline should not be used with infants under a certain age. The reclining feature is absolutely necessary for use with a baby who can’t sit up without support. Another tip, please note that if you have need of a twin (double or duallie),triple or a quad stroller, umbrella strollers may not be the best option for you. By all means go to the baby outlet store and try them out, you can’t tell much about performance from pictures or photos. When shopping for lightweight strollers, many proud parents shop for the cheapest strollers they can find. These moms and dads think that an almost disposable item at the lowest price they can find is the best deal. No Peg Perego Pliko P3s or Combi stroller for these bargain hunters! Even some of the least expensive models for 2007 are being manufactured in the same hot colors that Hollywood Movie Stars, Celebrity Moms and Rock Stars are choosing for their kids. Drawbacks: This is not a stroller for an all day excursion. It does not have an underseat storage area or a bar to be used for attaching stroller toys or accessories. It would also be nice if wheels felt a little more substantial and you will probably go through more than one. I don’t know anyone who really knows how to fix bent frames and broken connectors after all. It might actually be better to read stroller reviews and opinions on forums, find a well constructed, top-rated stroller and buy it used on Ebay or at a yard sale. If shopping for a used stroller, check recalls and be aware of any existing problems before making a purchase. Drawbacks: The lowest price I found was approximately $230 plus shipping. The assembly of this stroller requires that you use two hands to fold it. If you have problems juggling more than one child at a time, this may be a little bit of a problem until you get the process down. It’s also been reported on a few of the stroller blogs that I read that the cupholder could be a lot less flimsy. Most of your common names in strollers have at least one model they call a lightweight stroller or umbrella stroller. Storage could be better. Cup holders must be purchased separately. How chinchy! Oh well, the positives outweigh the negatives on this little jewel! Here are some top rated umbrella strollers in the lightweight stroller category from recent years past that you may want to try! 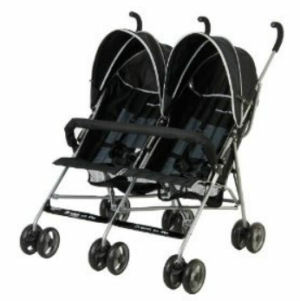 FOR MORE INFORMATION ON lightweight baby strollers please visit our homepage to find more information on the best umbrella strollers and Unique Baby Gear Ideas. Give other moms a heads up by rating your experience with any brand of lightweight umbrella stroller. Entering your umbrella stroller's rating is easy to do. Just start to type!... Do you love it or hate it? Is it ultra-light or a clunker? Your stroller rating will appear on a Web page exactly the way you enter it here. You can wrap a word in square brackets to make it appear bold. For example [my story] would show as my story on the Web page containing your story. TIP: Since moms are in a hurry, list high points of your pros and cons in your first paragraph and expand your thoughts further down in the article for the more determined reader. 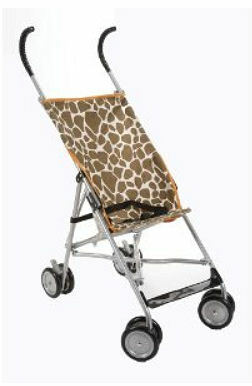 Do you have a picture of your precious baby (babies) riding in this stroller? Great! Click the button and find it on your computer. Then select it to feature those cute kids at the top of your stroller review. We love baby pictures even more than we love strollers!